All of these seemingly trivial activities amounted to 712 MB. Sure, Netflix isn’t something most people stream every day through their mobile service. But it’s not uncommon to watch a TV show on the train or the bus once in a while. Same applies to browsing the web or listening to Spotify. That’s why hitting the data limit of 1 GB, 2 GB, or 5 GB (depending on your plan) is relatively easy if you’re not on Wi-Fi at work or at home. Once that happens, your provider will likely throttle you back to 1997 web speeds (mostly 64kb/s or a limited EDGE rate). Here are some things you can do to limit your mobile traffic and understand why you hit that mobile limit. #1 – Pick the right plan! As the tech guy among friends and family, I get questions such as "What plan do I pick?" all the time. It is usually followed with "Should I get the more expensive unlimited options at $70? Or the 1 GB for $19 or the 5 GB for $39?" Well, it’s not an easy answer, as it depends on how much you want to do online. My advice is to spend half an hour using a data estimator tool. 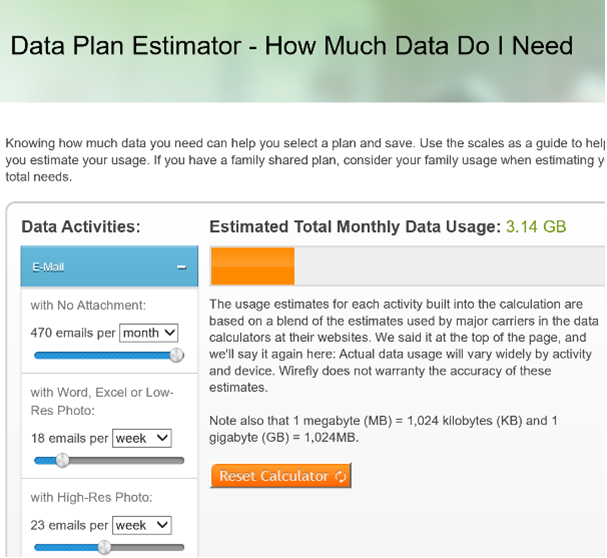 One example is Wirefly’s Data Plan Estimator. There are others out there, but this one does a decent job and is accurate. Pick your plan based on the estimated monthly usage, add another 1-2 GB as a buffer, and you’ll be worry-free. 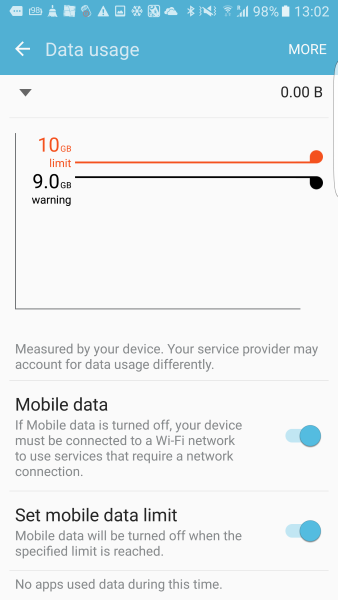 Flip the switch under Set mobile data limit. If you’re hitting your plan’s limit all too often, it’s high time you check which apps are actually responsible for this unnecessary drain. Some may be obvious and caused by your usage (e.g., if you stream Netflix all night, you will eventually hit the limit); others you may not be aware of. Here’s where our free AVG Cleaner for Android comes in. Download it and let it analyze your apps behavior for a couple of days or a week. 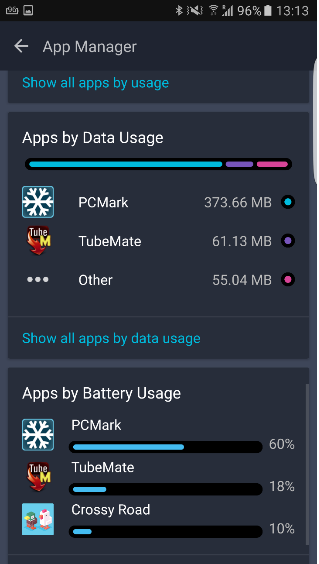 The APPS category shows the top Apps by usage. I was very surprised by which apps used up traffic over just two days. Oddly enough, I didn’t play Crossy Roads and I certainly did not download anything from TubeMate. These are cases where you need to open the app and try to figure out how to stop this secret consumption – or just delete the app if you don’t need it anymore. Google Maps is probably my go-to tool to navigate when I’m on the road. Unfortunately, at the end of the day, it’s not surprising to see that it has consumed a couple of hundred megs, as map data can be quite large (see below). 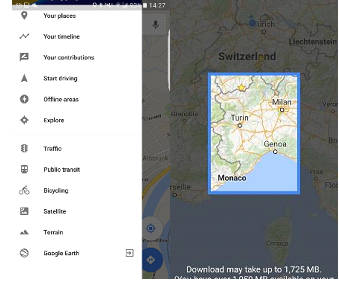 Luckily, Google Maps allows you to store map data offline, which is not just brilliant for reducing data traffic but also for situations when data navigation is unavailable. Tap on Offline Areas, hit the PLUS button and then select the area you’d like to use offline. This includes all POIs, all streets, everything. Using WhatsApp or other instant messaging apps? Well, if you’re like me, you’ll likely get auto-dragged into the oddest group chats and be the victim of countless of animated GIFs, photos, and videos. If you’re on 3G or 4G, turn them off to save some bandwidth. In fact, I'd recommend turning off the auto-download feature even over Wi-Fi, as a security measure. If you’re running older versions of Android that haven’t been patched for the Stagefright vulnerability, this auto-downloading feature can put you at risk. But don’t worry, you won’t miss any messages. Turning these settings off just puts you in charge of deciding what gets downloaded onto your device. Look in the Settings of any messaging app to disable the auto-downloading feature. If your messaging app doesn’t have that control, it might be time to look into getting a new one. Most mobile browsers, such as Chrome or Opera, now sport compression features. Data will get rerouted through servers (e.g., Google’s), compressed, and then sent to you. You will notice that, for example, photos may look slightly fuzzier as JPGs, as they will be compressed just a tad more. To turn it on, open your browser (Chrome in our example), and tap on Settings. Go to Data Saverand switch it on. 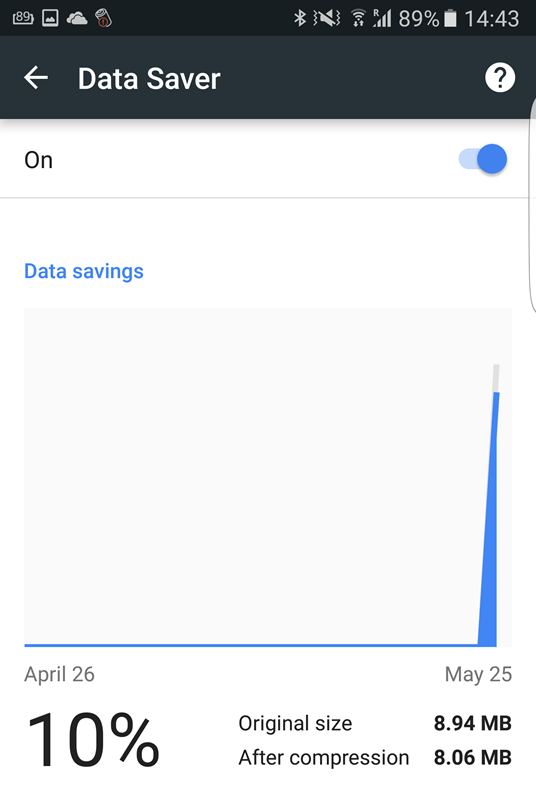 The graph below shows that a single visit to The Verge, which included browsing a few pages, resulted in a 10% data savings. Not bad! There is a dark side to compression you need to be aware of: it transfers your browsing history to whatever server is doing the compression and also disables any ad blocking.